At this very moment, someone is digging up competitive intelligence on a company (maybe even yours). They’re figuring out how much it’s spending on marketing campaigns, what software it uses to power its website, what paid keywords it is bidding for and much, much more. And, they’re doing this without ninja online research skills. Without some expensive, specialized online service. They’re simply asking questions and having conversation with a chatbot that was built for this very purpose. 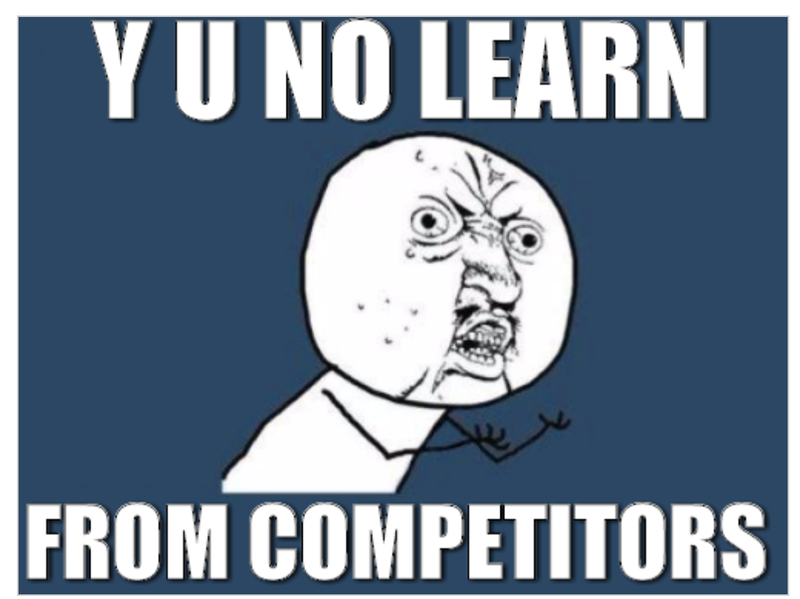 Hi, I’m @dharmesh and I built you a secret weapon for learning from your competitors. OK, fine, I didn’t initially build it for you, I built it for me. It’s something I needed for myself. Why? Because I’m curious about companies all the time (sometimes, they’re competitors, sometimes they’re customers, or startups I’m curious about). And, I got tired of having to use a bunch of different websites to get the answers I wanted. So, I built a bot so I could just ask it. Quick, convenient answers. It is better to obsess over your customers than your competitors. Generally, I don’t advocate for getting too obsessed about your competition, but when you can you should learn from them. Where are they spending their marketing dollars? What channels are working for them? How big are they? Which keywords are they buying? Who do they compete with? You shouldn’t follow your competition. But you should definitely learn from them. Often, you can glean from them in a few seconds, for free, what might have cost them thousands of dollars to figure out. Let’s say you’re building a company that competes with HubSpot (I’m not going to recommend that, given that I’m one of the founders). Or ZenDesk. Or Buffer. Or HelpScout. Or some other company. 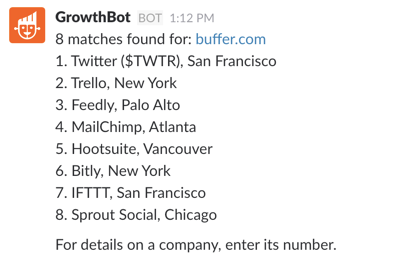 If you’re a Slack fanatic like me, add GrowthBot to Slack. If you’re a Facebook fiend, just message hello to @GrowthBot on Facebook Messenger. Note: When asking the question, use the company’s website domain(if you know it), it’s more reliable and is a tad faster. how many employees work at hubspot.com? This will give you an estimate of how many full-time employees the company has. Some broader information on a company, including their location, social media profiles and an estimate/guess on revenue. 2. what companies are similar to buffer.com? This will give you a list of both competitors and those in a similar category or geography. 3. when was the domain hootsuite.com registered? This will tell you when the domain was first registered, when it set to expire, and who is the current owner. This doesn’t tell you definitively when the company started (because often, domains are bought and sold after their initial registration), but it’s still fun to see. For startups, the person registering the domain is usually one of the founders. In this case, Ryan Holmes, Ryan Holmes (founder/CEO). 4. how much is freshdesk.com spending on PPC? Now, things start to get interesting. You can get a sense for how much the company is spending on pay-per-click campaigns. If the company has been around for a bit, and they’re spending a bunch of money, there’s a decent chance it’s working for them. 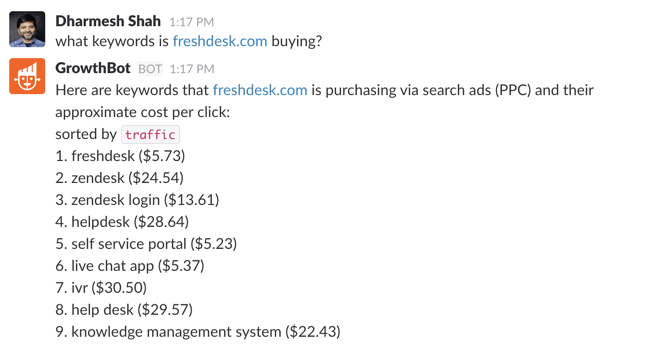 5. what PPC keywords is freshdesk.com buying? 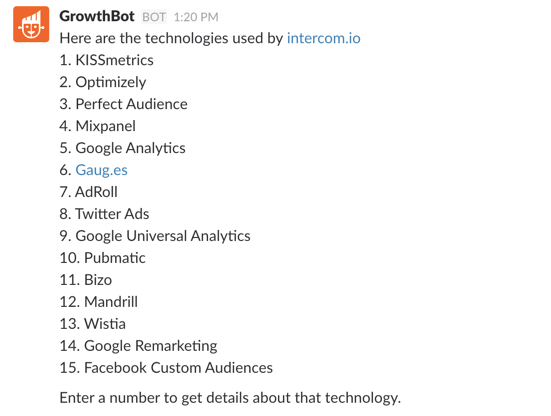 If the company is running pay-per-click campaigns online, GrowthBot will tell you which keywords they’re buying (and how expensive those keywords are). Even if you don’t plan to run any PPC campaigns, this is very useful information because it tells you how they’re thinking about their business and which keywords they think potential customers are searching for. 6. who is invisionapp.com competing with on ppc? Chances are, if the company is spending money on PPC campaigns there are other companies also bidding on those same keywords. This will tell you who those companies are. Often, this reveals competitors that you might not have thought of. 7. which organic keywords is xero.com ranking for? This will show you which keywords the company is ranking for organically (non-paid) in Google (and what their ranking is). By looking at this list, you can get a sense for what their content strategy is and what Google thinks their website is about (based on links from other websites). 8. what are the top blog posts on hubspot.com? Chances are, the company you’re interested in is writing a blog. This will tell you which of those blog posts having gotten traction recently (have been shared a bunch on social media). 9. what tech does intercom.com use? This will tell you what software a company is using on its website (primarily focused on marketing and analytics tools). Often, this will reveal what areas of marketing they’re investing in. Note: This feature can’t tell you every technology the company uses — just the ones that can be detected from their public website and that are focused on marketing/sales. 10. who are the top twitter followers of @hubspot? It’s often useful to take a quick browse through which industry influencers are following your competitor. (Ignore the large media sites, celebrities and auto-tweet accounts). Focus on the one or two actual humans with a fair number of followers but who seem to be engaging with others. Follow them and engage (authentically). Don’t pander, but try to forge a real relationship with them. If you keep tweeting smart things, retweeting their best tweets and resist the temptation to pitch them or ask them for something — they will eventually notice you. 11. How much traffic does moz.com get? You will be surprised at how much traffic even B2B companies can draw. Of course, this one’s a special case because @rand and the Moz team are amazingly good inbound marketers. Note: Estimating website traffic is an imperfect science (some might argue it’s a dark art). Your mileage will vary. 12. Which are the sources of traffic to hubspot.com? This will give you a sense for how much traffic the site is getting via social vs. organic search vs. other online channels. 13. Which ad networks is zendesk.com using? You probably know about Google. But, did you know there are many other ad networks out there — many of which perform well for certain industries and categories? Take a peek at which networks your competitors are using. You might find some ideas as to where you can channel some of your own marketing budget. Just start asking, some of the answers will surprise you. 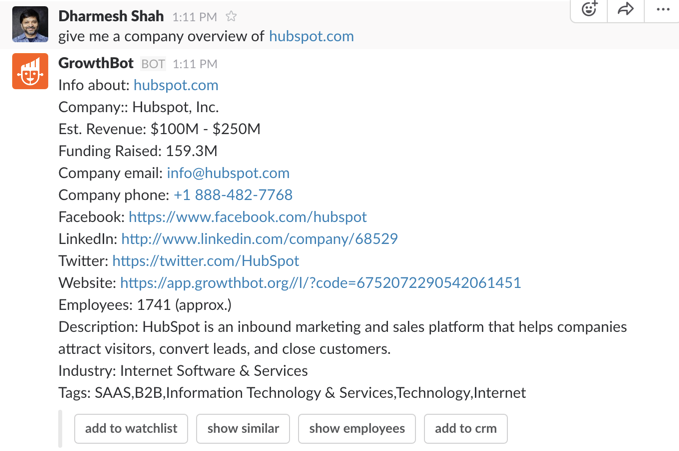 In case you missed the links the first time, you can ask these questions on: GrowthBot for Slack or just send a quick message to GrowthBot on Facebook Messenger. Did the fact that you could ask some of the above questions surprise you? If so, which ones? What kinds of things would you like to be able to ask?